Canyoning is the act of traveling or a journey through canyons that includes the techniques of outdoor activities like hiking, climbing, jumping, swimming and many more. Although, canyoning is often taken as hiking through the canyons, in technical terms it is an activity that relate to ropes and rattles, involves climbing up and down a canyon technically and includes technical swings. The activity usually involves the climbing of the remote and rough structures through navigation, route finding and other travel skills. Apart from the rocks, gorges and the walls, the waterfalls are also the excellent options for the canyoning activity. 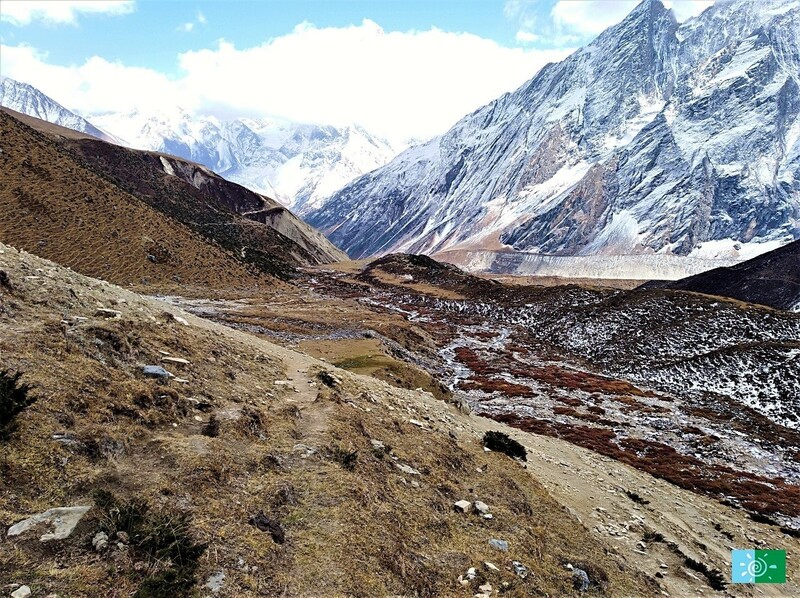 Nepal is geographically diverse country with varied landscapes and many natural resources. 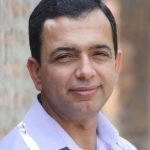 Luckily, the nature has blessed Nepal with so much of the natural resources which include many shallow and swift rivers and majestic waterfalls making their way between the hills. 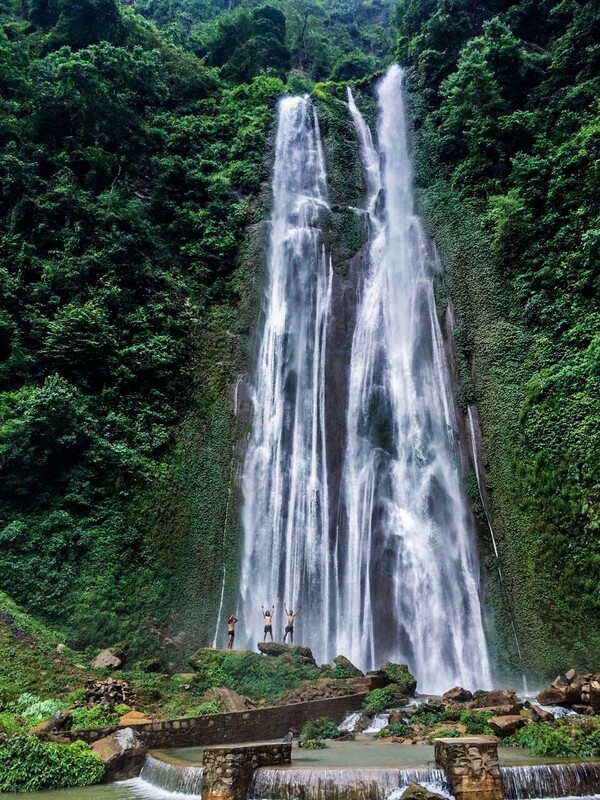 These waterfalls not only add beauty to the environment, but are also the sites for adventures for thousands of people all around the world. The majestic waterfalls, rock slides, and the giant jumping rocks are something really exciting to experience in Nepal. This makes Nepal a favorite destination for those who love to challenge the adventure like canyoning. The canyoning, along with trekking, climbing, and rafting, now is being an important element that promotes the tourism in the mountain region in Nepal. It won’t be wrong to say that Jalbire or “the Lamo Jharana” is the best and most favored canyoning destination in Nepal. The Jalbire canyoning is a once in a lifetime experience which will allow an individual to experience the amazing waterfalls, rock slides, and the jumping rocks. The Jalbire is also regarded as “the best attraction” in Nepal by many tourists. There are almost 5 waterfalls with the height about 40-50 meters. Depending upon the climate, canyoning can be done in all these waterfalls. But, the volume of the water in the waterfalls should be understood closely. Jalbire lies on the way to Narayanghat from Kathmandu. It is 100 kilometers away from the capital city of Nepal; Kathmandu. A road trip of about 2 to 3 hours in a private vehicle will leave you to Jalbire from the Kathmandu. There is a display board on the road after you get off the bus. Now you need to walk about 95 meters to reach the Lamo Jharana. It will take you no more than 20 minutes. Being the capital of the country and having the only international airport of the country, Kathmandu is the first priority for the most tourists who enter Nepal. Kathmandu has always amazed the tourists with the facilities in many ways. Whether it comes to culture and tradition, or various adventure activities, Kathmandu has become a wonderful destination in Nepal. There is place in Kathmandu for canyoning as well which includes canyoning in Kakani, Sundarijal, and other places around the city. 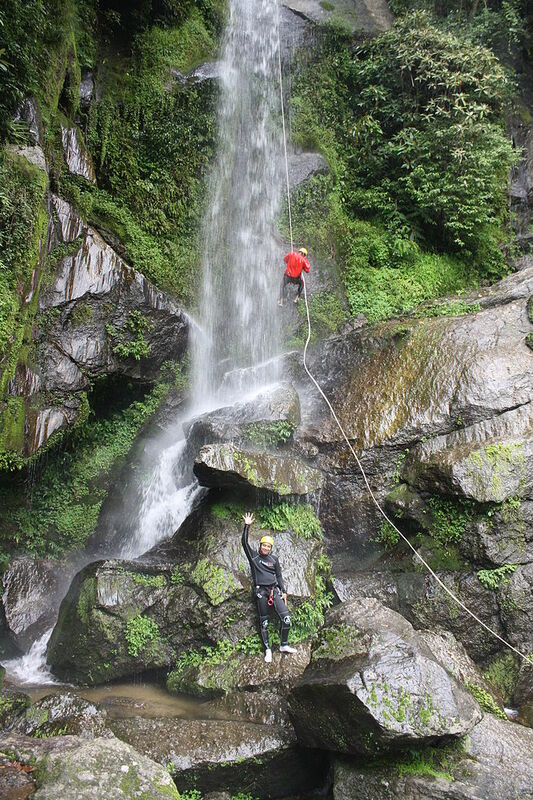 Kakani is the canyoning site which is available near to the Kathmandu city. The Kakani is about 35 kilometers away from the Ring Road of Kathmandu and thus is very easily accessible. There are two canyons: Phung Phungye (185 meters) and Chhahare (145 meters) situated in the Dhansar village and Jurethum village in the Kakani area. 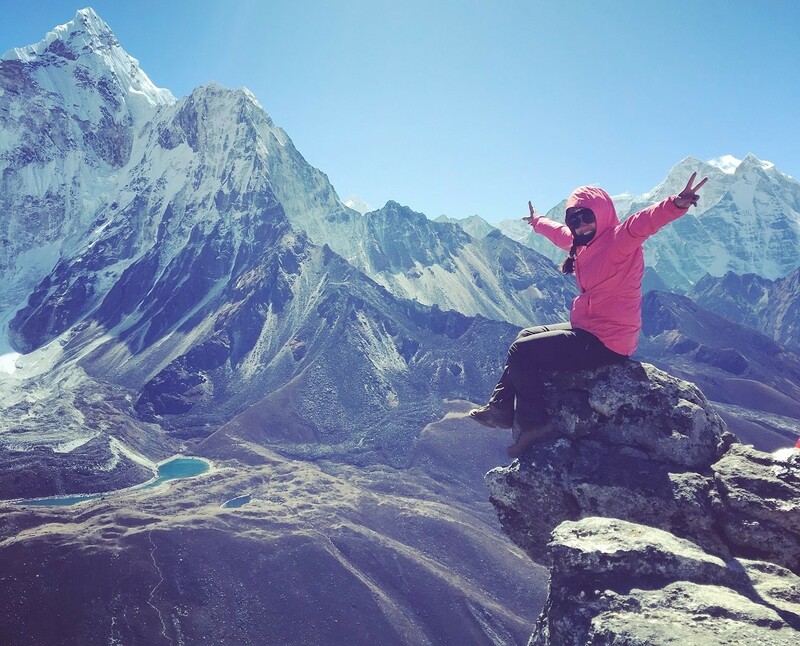 Both the canyons are perfectly settled with Phung Phungye especially with the view of the panorama of the Ganesh Himal, Manaslu and the Langtang regions. Sufficient amount of water falls from the canyons in all seasons and is neither too hot nor too cold. A ride on a private vehicle or a public vehicle, both are available. One can catch a local bus from Machhapokhari, Kathmandu to reach up to Kakani. After the vehicle drop you to the Kakani village, you now need to walk for about half an hour to reach the canyon of the Phung Phugye. The canyoning activity is of about 2 to 3 hours, so you can start your canyoning on the same day you reach the site. After the completion of the canyoning, trek back the same way to reach the road and catch the bus. In case you find it a bit hectic in the same day, you can also plan to stay the night in the Jurethum village. The next morning you can take village tour and walk around to see the fish farm where the farmers farm the world-famous Japanese Trout Fish. Sundarijal meaning “beautiful water” is a beautiful single day trip for canyoning. Sundarijal is also popular for hiking, swimming, picnic, and biking. Resting in the bottom of the Shivapuri National Park, it is 17 kilometers north-east of Kathmandu. 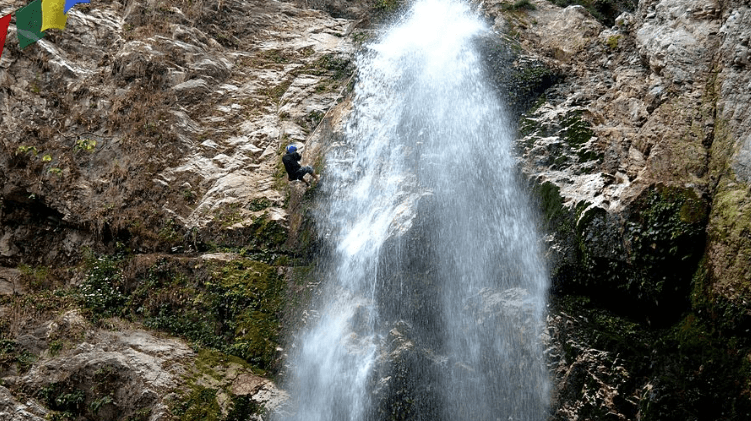 Swimming and canyoning in the waterfalls of the Sundarijal are the most enjoyed activities by the local people in Sundarijal. The bus park in Sundarijal is only about an hour drive away from Thamel, Kathmandu. From Sundarijal Bus Park, buses are available that will drop you to the Sundarijal village. The canyoning site is further half an hour uphill from the Sundarijal village. 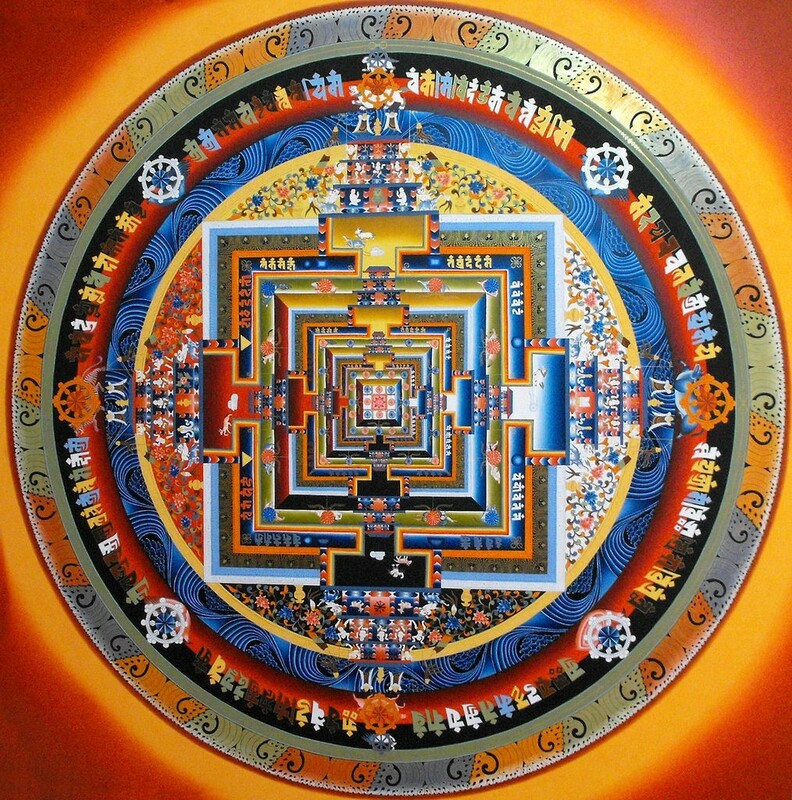 The Charaudi is 56 kilometers west of the capital city, Kathmandu. The Charaudi is about 35 minutes drive from Kathmandu city. If you are looking for the rafting adventure in Nepal, then Charaudi is an ideal option. Monsoon would not be a problem if you are planning for Charaudi adventure. The amazing waterfalls, fun walks and the pool at the bottom to splash you up will add extra adventure. The Charaudi also provides the opportunity to have some chitchat with the children of the village who come to the pond for swimming. The popular tourist destination, Pokhara, always serves the tourists with a variety of the activities. Admiring the beauty of nature, getting into the culture and experiencing some thrilling activities, all are possible in Pokhara. Pokhara also offers the thrilling experience of climbing the rocks accompanied by the waterfalls. The sport spot is about one hour ride away from the main city towards the trails of Lwang Ghaley Village, VDC Ward No.5/6. The spot is in the height of 1350 meters above the sea level. The canyoning involves the climbing through the cave; fall down from the waterfalls that are 45 meters and 75 meters long and then finally resting down in the clear ponds. Not very far from the capital city, Kathmandu, has the Bhotekoshi served tough and challenging canyoning swing in different sites. There are four canyoning sites which include the Jombo Khola (3 hours), Handi Khola (4 hours), Kabre Khola (3 hours 45 minutes), and Galung Khola (6 hours). Thus, canyoning in Bhotekoshi is the best destination for someone who is looking for several attempts in a single trip. Also, one can easily return to Kathmandu after their canyoning activity on the same day. Trishuli River is one of the most popular destinations to experience the water sport in Nepal. Along with rafting and Kayaking, Canyoning is also a popular sport in Trishuli. The impressive gorges, the speed of the water and the accessibility to the site have been additional plus point to the site. Trishuli canyoning offers you with the challenging adventure of hanging down a vertical cliff and being splashed by the water overhead. Although canyoning is fun and full of excitement, chances of accidents still prevail. The high water flow/ hydraulics, flash floods, Hypothermia and Hyperthermia, Being lost, and Rock fall are some of the hazards associated with the adventurous sport of canyoning. Safety suggestions by the guides must be strictly followed by every single person that participates in the activity. In case you don’t the guide also have the right to exclude from the tour. Nepal Sanctuary Treks is top Trekking Agency in Nepal. We have been in this industry for 30 years, providing high quality services to our guests all over the world.